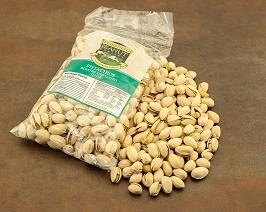 These crunchy Pistachios are roasted and lightly salted... ready for you to enjoy! Pistachios are little green seed, sometimes referred to as "Green Almonds", but actually, they are members of the Cashew family. These little green nuts are rich in antioxidants and are an excellent source of protein, fiber, vitamins and minerals.